Tell us a bit about yourself (where you grew up, what you do to rejuvenate yourself and relax, how your got into Jewish food, what is your go-to meal, what you are reading right now). I grew up in New Jersey, in a pretty rural town that wasn’t all that far from New York City. I visited the city fairly often with my father, a Brooklyn kid, and that’s where I learned about delis, appetizing shops and even knisheries. I’ve always loved both the city and the outdoors. I currently live in Brooklyn, but I moved here from a farm in Northwest Connecticut where I learned to make pickles and jams, to grow organically and to brew biodiesel fuel from used vegetable grease. I try to get out of the city and go hiking in the Hudson Valley and the Piedmont Mountains of New Jersey. I play basketball regularly. I love to play around in the kitchen, too. When I’m in Manhattan, I tend duck into a classic Jewish deli for matzo ball soup when it’s cold out. All winter long I crave it. I’m currently reading The Revenge of Analog by David Sax. What was your ah-ha moment about working in food, and Jewish food in particular? Not sure I had that a-ha moment. I was working in food, importing organic products from the Middle East, working with small olive oil producers in places like the Negev, and as I was doing that, articles appeared in most newspapers about the death of the Jewish deli and the decline of Ashkenazi cuisine. I felt like I needed to devote my time and energy to making sure the foods of my tradition didn’t die with the older generation. Living in Brooklyn in the midst of the recession, where the artisanal food scene was growing and everyone and their mother was starting a pickle company or an artisanal mac and cheese company, I looked around and felt like I didn’t see “my food” represented. 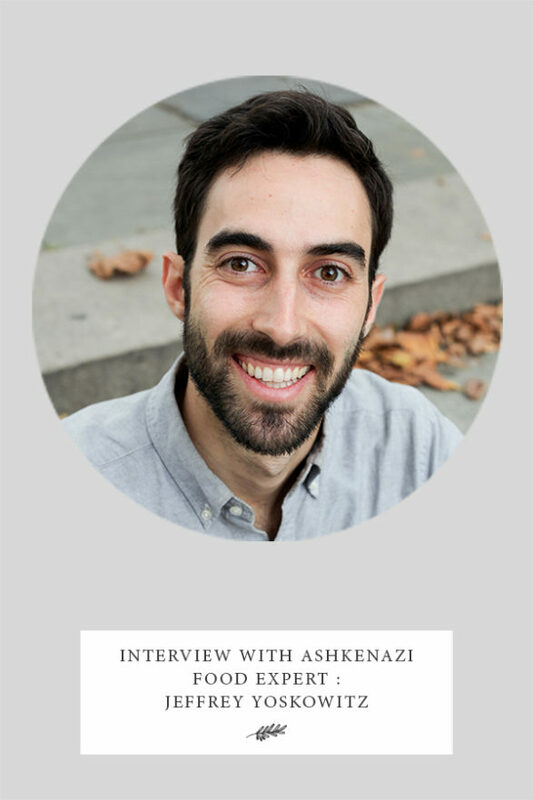 So I launched The Gefilteria with the intent to make artisanal versions of Jewish foods, and even more importantly, to do my part to bring about a renaissance in Ashkenazi cuisine. How have trends in healthy eating affected your cooking and recipe creation? My primary motivation at first was to create Jewish food products that matched the values of the day. I was making probiotic pickles and Ashkenazi kale salads and gefilte fish using higher quality, more sustainable fish, without gmo oils and without the usual fillers that were full of gluten. Much of that was in response to the health and environmental trends of the day. A year or so into this venture, however, when The Gefilteria began catering meals, running pop-ups and presenting at outdoor markets, I began focusing less on responding to current health trends and more on mining Ashkenazi cuisine for its built-in nutritional wisdom, much of which, it turns out, correlates with current health studies. For instance, the sour garlic and dill pickles I’ve been making for years are lacto-fermented, meaning they’re probiotic and great for digestion and immune support. That’s also how you make a good Jewish pickle. Recently there’s been a reversal among nutritionists with respect to animal fats, and foods like schmaltz, which were once shunned, are now celebrated. Fortunately, schmaltz has always been a big part of Jewish cooking. What feelings do you associate with Jewish food? Since laughter and jokes so often accompany a good meal, I’d have to say mirth. And as a grandchild of holocaust survivors, I’d often hear stories of sorrow and tragedy during holiday feasts, so I’d say sadness. What role does food have in Jewish tradition? Is this role changing in the twenty-first century? I studied religion and history at a Jewish day school for much of my childhood, but it was only at home, with my family, that I learned the culture of our Polish-Jewish ancestors. It all started in the kitchen. I tend to resist the “we survived, now let’s eat” view of Jewish food’s role in the tradition. I find that cooking and eating offer a rhythm for Jewish life. The big feasts with the more labor-intensive and calorie-rich foods mark the holidays, and in each separate culture, the adaptation of a local cuisine to Jewish dietary laws makes up our day-to-day foods. I think lately there’s been this idea of “global Jewish cuisine” which merges together global dishes from around the world. I’m more interested in the regionalisms that make Jewish life so diverse and rich. I have personally been exploring Ashkenazi cuisine deeply and I’m really inspired by peers of mine who are doing the same for Italian-Jewish or North African Jewish or Iraqi-Jewish cooking, to name a few. I think the disambiguation of Jewish cooking is the future. How do you picture the impact of Gefilteria in ten years time? My hope is that people (Jews and non-Jews) will think of Ashkenazi culinary heritage as relevant and a full-fledged cuisine, on par with other major cuisines around the world. And I hope that a new generation will take pride in their culinary traditions, which wasn’t so much the case when I was growing up. I also think The Gefilteria has played a major role in changing the narrative of gefilte fish as a maligned Ashkenazi dish. There’s been a bit of a gefilte fish renaissance as of late, with chefs in places like Buenos Aires, Tel Aviv and Berlin exploring the dish. We went all in on gefilte fish about 6-7 years ago and started a conversation. I hope to see that the conversation has continued. What do you feel the most proud of about your work? I’m most proud of all the teaching that’s increasingly become a big part of my work. I’ve been presenting to audiences around the world about Ashkenazi Jewish culture and history, in places as far away as Australia and Finland, and in parts of the US with small Jewish communities, like Charleston and Louisville. I know a lot of people are searching for meaning in their own histories and family traditions – I’m glad that I’ve been able to connect the dots for many people. I’ve also been able to teach high schoolers and college-aged students and hopefully offer them a piece of their cultural heritage that will inspire them going forward. What would your grandparents say about Gefilteria? Well, my grandmother is still alive and she doesn’t quite know what to make of what I do. She thinks I’m just a caterer. But she has read The Gefilte Manifesto which credits her with so much inspiration and retells many of her stories, and I know for a fact that it really makes her proud. She’s especially excited to know that her strudel recipe is out in the world. What is it that keeps you motivated and excited to do this work? Jewish foods of eastern and central Europe carry with them a lot of emotion. At any given event or dinner or book talk, I hear people’s stories with these foods, whether someone grew up with a carp in their bathtub or a grandmother who made stuffed cabbage every week. Those stories are very nourishing for me, as is the feedback from many people I feed or speak to that my work is inspiring and gratifying for them. For men and women who want more resources on Jewish food, what books would you recommend? A book that came out recently that offers a unique historical perspective (and that’s also quite entertaining) is Rhapsody in Schmaltz by Michael Wex. David Sax’s Save the Deli is one of the books that inspired me to start The Gefilteria. Jane Ziegelman’s 97 Orchard is a real historical gem. And I’d add the recently translated from Yiddish to English cookbook, The Vilna Vegetarian, since it offers such a window into Jewish life in Vilna in the 1930s. That’s just the tip of the iceberg, to be honest. There’s a pretty significant bibliography in the back of The Gefilte Manifesto, which is to say that there are a lot of works of scholarship and on this subject that speak to me. Your turn: Tell us the title of your favorite Jewish food book. Previous What Is Your Pantry: Sabrina Perl?